For me, the period of time between Thanksgiving and New Year’s is usually a kind of personal sacred time. Each year I begin this five week season by making a list of all the people, events and things in the past year for which I am thankful. Then I go thru Advent with a sense of yearning, anticipation and renewed hope for a better world. Advent then culminates with the celebration of Christmas with its mixed focus on the birth of Jesus, the coming together of family, and the sharing of presents. Then a week later we welcome a new year and I write down hopes for the year to come. I began this practice nearly 40 years ago when I was in college and it has served as sort of liminal time where I move from one year to the next, from being fatigued and doubting to having a renewed hope and focus for the future. However, this year my Thanksgiving to New Year’s sacred time has taken on a different feel. Two days before Thanksgiving the decision was announced that Officer Darrin Wilson would not be indicted in the shooting of Michael Brown in Ferguson, MO. A week later a similar announcement was made regarding the officers responsible for choking and killing Eric Garner. 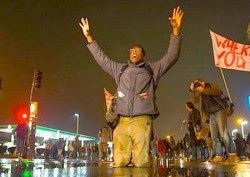 Almost immediately demonstrations erupted around the country. Die-ins were held in select shopping malls on Black Friday. In cities from east to west groups of young people marched with hands held high signs saying “Don’t Shoot,” “I Can’t Breathe” and “Black Lives Matter.” Here in Philadelphia there have been marches that interrupted the city’s Christmas Tree lighting ceremony, a die-ins at major intersections during rush hour and following a Philadelphia Eagles game, a service of the Seven Last Words of Black people, and numerous marches throughout the city. Even larger gatherings have occurred in New York and Washington bringing attention to this issue on both a local and national scale. While I have not participated in any of these marches or demonstrations, I have watched them closely and have been a part of numerous conversations both formal and informal. In these conversations there have been a wide range of emotions expressed from anger to guilt to confusion. Many of my white friends have wondered where and how and whether they should fit in the demonstrations. Others have wondered where the demonstrations will lead and what if any changes will come about because of them. Some media commentators have focused on the few instances of violence and have questioned whether demonstrators are “hurting their cause” by interrupting normal activities and generally causing disruption. To be sure in many ways at this point the demonstrations appear to more about expressing anger and frustration at police brutality and more generally a unjust criminal justice system, than calling for concrete specific change. However, as I have studied the history of social movements, and particularly the Civil Rights Movement, what appears in hindsight to have been a clear, focused effort toward social change was at the time it occurred often chaotic, controversial and confusing. For that reason, I share the demonstrators’ anger and frustration, and at the same time I have hope that emotion can be channeled into concrete action for positive social change. However, if history teaches us anything, that process will be haphazard, confusing, frustrating and filled with stops and starts. Thus it will require clear leadership and perseverance over a long haul. 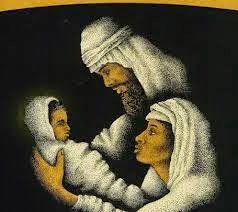 Then when the infant Jesus was presented in the temple a few days after his birth, the prophetess Anna and the prophet Simeon proclaimed the child was the harbinger of a new age.. The birth of Jesus, while at one level benign and blessed, at the same time set in motion a process of significant change. Contrary to the image of a silent blessed night, the birth of Jesus was accompanied by violence, chaos and fear, as well as hope for a better day. At the heart of the Christian story is a God who enters history for the purpose of interrupting and disrupting the status quo in order to bring hope and justice to hurting and oppressed people. 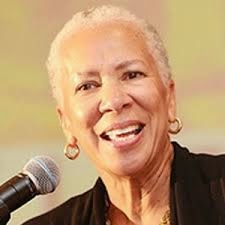 Angela Glover Blackwell, the CEO of Policy Link, an organization dedicated to promoting equitable and sustainable economic development in low income communities, grew up in St. Louis and recently spoke about the events in Ferguson over the past few weeks. Like Black people in nearby Ferguson, Glover as a child remembered being treated as a second class citizen because of her skin color. Reflecting on recent events in light of Civil Rights Movement in the 1960’s, she suggested that the demonstrations are a sign that people have hope. When people have hope and their expectations are not met, they get angry and act out. Thus, while recent events may appear on the surface to be chaotic and at times even violent, Blackwell believes they are a sign that people want better and are willing to speak up and work for it. In the same way, the birth of Jesus was a sign of hope for his time and for ages to come. 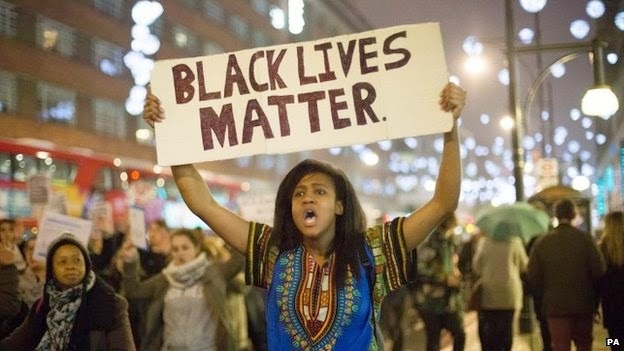 Perhaps in interrupting and disrupting our normally festive Christmas season, these demonstrations remind us that God is again breaking in to move us to work for a society where race and class are no longer the determining factor as to who is treated fairly and humanely, and who is not. They are a sign that people of faith and conscience, working together can and must fight to create a world where the lion and the lamb can lay down together and where the young black man and the white police officer can achieve reconciliation at a table of mutual respect, common concern and equitable justice.